Life In A House of Blue ! 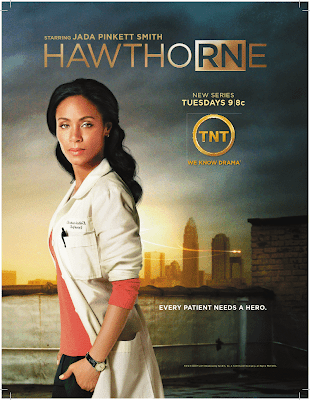 : “Tuesday Night On TNT” Giveaway - HAWTHORNE Poster- Autographed by Jada Pinkett Smith & SAVING GRACE Season 2 DVD Set. HAWTHORNE Poster- Autographed by Jada Pinkett Smith & SAVING GRACE Season 2 DVD Set. As many of my readers know that I really enjoy TNT programming. Tuesday nights is one of my favorite nights to watch TNT. The Tuesday lineup includes 2 great shows I enjoy watching , HAWTHORNE & SAVING GRACE ! HAWTHORNE is a new series that started on June 16th. it airs every Tuesday at 9 p.m. (ET/PT). SAVING GRACE is in it third season and airs on Tuesday at 10 p.m. (ET/PT) on TNT. Jada Pinkett Smith (The Women, The Matrix trilogy) is the latest talented actress to join TNT’s line-up of strong, complex female characters, following in the footsteps of Kyra Sedgwick on The Closer and Holly Hunter of Saving Grace. In this character-driven medical drama, Pinkett Smith plays Christina Hawthorne, a compassionate and headstrong Chief Nursing Officer heading up a group of dedicated nurses at Richmond Trinity Hospital who spend long days and nights on the hospital’s front lines. Hawthorne is the kind of nurse you want on your side when you or someone you love is in the hospital. She is the kind of nurse who fights for her patients and doesn’t let them slip through the cracks. When necessary, she takes on doctors and administrators who are overworked, distracted or just unable to see the human being behind the hospital chart. Joining Pinkett Smith in HAWTHORNE is Michael Vartan (Alias) as Dr. Tom Wakefield, the oncologist who treated Christina’s husband and who serves as director of medicine for the hospital. The cast also includes Suleka Mathew (Men in Trees) as Bobbie Jackson, a fellow nurse and one of Hawthorne’s best friends; David Julian Hirsh (Lovebites) as Ray Stein, a nurse struggling with being accepted in a female-dominated profession; Christina Moore (90210) as Candy Sullivan, a nurse with a unique sense of duty; and Hannah Hodson (TNT’s The Ron Clark Story) as Camille, Hawthorne’s daughter. In addition, special guest star Joanna Cassidy (Six Feet Under) portrays Amanda, Hawthorne’s mother-in-law, who also happens to be a member of the hospital board. Get a sneak peek of "Trust Me," tonights episode of HawthoRNe, premiering Tuesday, July 21 at 9/8c. Academy Award® winner Holly Hunter returns in this bold series as a gutsy Oklahoma City Police detective who holds nothing back, whether on the job or in her personal life. The series follows as she investigates brutal crimes while also trying to balance her relationship with her partner, Ham (Kenneth Johnson – The Shield), and figure out cryptic messages from her last-chance angel, Earl (Leon Rippy – Deadwood). Hunter’s acclaimed, tantalizing performance recently earned her a second consecutive Screen Actors Guild Award® nomination. She is joined in the series by an ensemble cast that includes Bailey Chase (Las Vegas), Gregory Cruz (Criminal Minds), Yaani King (The Prince & Me) and Dylan Minnette (Prison Break), with Lorraine Toussaint (Any Day Now) and Laura San Giacomo (Just Shoot Me). The first season of SAVING GRACE on TNT, ranked as one of ad-supported cable’s top new series of 2007, averaging 4.7 million viewers. The show’s second season averaged 4 million viewers and ranked as ad-supported cable’s #1 entertainment program in its timeslot among adults 25-54, viewers and households. SAVING GRACE was created by Nancy Miller (Any Day Now). Get a sneak peek of "Am I Going to Lose Her?," tonights episode of Saving Grace, premiering Tuesday, July 20 at 10/9c. TNT is offering my readers a “Tuesday Night On TNT” Giveaway, one winner will receive a HAWTHORNE Poster- Autographed by Jada Pinkett Smith (slightly damaged, small hole on the side) and a SAVING GRACE Season 2 DVD set. Winner has been emailed, you have 48 hours to reply ! we love to watch Saving Grace! I don't watch too many of the shows reguraly but my mom likes The Closer and I wanted to try watching Hawthorne more. It seemed good from what I did watch and I love Jada. i'm following your blog as well. TNT is one of my favorite channels this summer. I ♥ The Closer, Raising the Bar, Hawthorne, Leverage and Dark Blue! I want to start watching Hawthorne. I don't have PayTV, so this is my chance to see it. Please accept my entry. Thank you. I'd like to see Hawthorne, and Leverage is good. I love The Closer. Thanks! Saving Grace and The Closer are favorites, Hawthorne is a disappointment. I plan to watch Closer for the first time. Thanks for the giveaway! I followed your blog (sunnyview99)! We love Office and House. Thanks for the chance. I didnt realize Angel was on TNT? I say Angel would be something I would watch. I love Saving Grace and the Closer! Personally, I like Kyra! I watch The Closer! I love all the shows on TNT . I watch The Closer,Raising The Bar,Saving Grace and HawthoRNe. Saving Grace because it's great to have Holly Hunter back. Our favorite TNT show is Grace. We have recently started watching Hawthorne and are really enjoying it as well. Another of our favorite TNT shows is The Closer on Monday nights. I am also a Facebook fan. I have watched The Closer on TNT. I enjoy the Closer, when I get a chance to watch, and Las Vegas. I love The Closer and Law & Order. You are on the Cool Blogs blog roll on my right side bar. I really like Hawthorne, Saving Grace, and The Closer! Thanks for the great giveaway! My sister says that I need to watch Saving Grace. We heart Miss Sedgwick in "The Closer"! I haven't seen it before, but Saving Grace sounds like a show I would like and should check out! Hawthorne looks like a good show. I would love to win this for my husband for his birthday. He likes Saving Grace and I like Hawthorne. Please enter my name for the drawing. Thanks. I really want to watch Hawthorne, if other TNT shows are any indication I will love it. I've been watching Hawthorne this summer and always watch The Closer & Saving Grace. Strong women are in the lime light and capture our hearts. I love Saving Grace and I will check out Hawthorne. Thanks for the giveaway. I plan to watch Saving Grace.